Autumn's finally arrived and is the season in fashion where the cosy jumpers and comfortable leggings come out of hibernation and creep into our wardrobes. To prepare for the new fashion season I decided to find some Autumnal clothing that's both cosy and cute to hopefully help some of you guys out who are struggling to find some items to freshly update your wardrobe this autumn season. I couldn't not include something burgundy when it comes so autumnal fashion as that is clearly the Autumn staple colour and has been for a while now. So I decided to include this super cute burgundy corduroy skirt which is a perfect piece to add to the wardrobe. It is available in Topshop. I was considering looking for a dungaree dress and when I spotted this on Boohoo I immediately fell in love, it's basic and simple but looks really cute with pretty much any top. Although I think of dungarees being in fashion in any season just imagine them in Autumn when your baking cinnamon and ginger cookies with pumpkin scented candles burning in the back ground. Okayyy, it may be burgundy again but who knows what the weather may be like or when you simply want to make a fashion statement? This extremely cute distressed pink crop top is available on misguided. Being completely honest I found it quite hard to find any jumpers that were't cropped but good thing they're in fashion (not so good if you experience Extremely cold weather during this season). A lot of hughstreet fashion stores will most likely have some cropped jumpers in stock too but if these simply don't agree with your current weather situation then I would recommend getting a jumper dress. 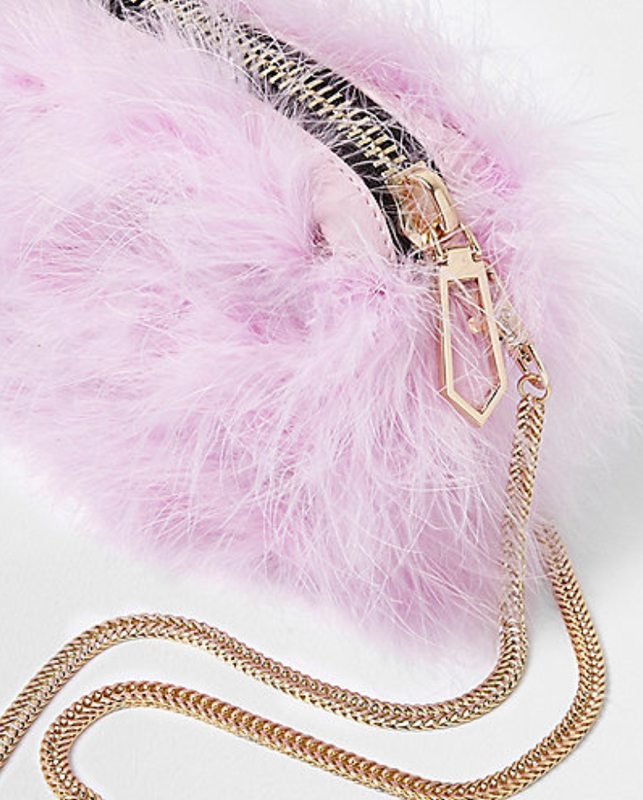 These will keep you super snuggly as well as in fashion this Autumn. I would recommend getting a denim jacket if where you are the weather is starting to get cold after the summer season but still isn't quite cold enough to bring out a big fluffy winter coat. Denim jackets go with a lot of different clothes and should hopefully keep you just the right temperature. As the weather gets cooler so do the boots and New look have some really nice boots this autumn (that also come in burgundy if you don't already have enough). Boots are one of my personal favourite type of shoe to wear as not only do they keep your feet enclosed and hidden from the freezing outside world but they also go with a lot of outfits, especially if they're black. L'Oréal Paris Paradise Ecstatic mascara- I'd heard quite a lot of good things about this mascara and it only came out recently in the UK so I was very excited to try this. I haven't yet tried any mascaras from L'Oréal so I don't have any expectations or an idea as to how it might go but am hoping to be impressed. What is the mascara best for? L'Oréal claims that the feather soft brush and silky smooth formula will team together to give your lashes intense volume and spectacular length without flaking. This mascara is average drugstore price selling for £11.99 in Superdrug and Boots. The applicator for me was a very good shape as I found it really gripped onto my lashes without getting it all over my lid. It separated my lashes and gave them the volume and length I was looking for. It stayed on all day without transferring on to my face and there were no signs of flaking and hardly and absolutely no clumps. The mascara itself had a smooth texture, appears to have a solid intense black colour and had a light, non-clumping texture. The applicator was extremely soft like it stated and applied really easily with little effort. However the brush is slightly to big and thick and gets in the way if you try to do bottom lashes but it's definitely still manageable. You will also find it is very buildable but one coat is all you really need to get the full effect. Apply applicator onto lashes in and upwards motion starting at the root and repeat depending on however many layers you want to apply. Definitely worth it ,this mascara did everything it claimed to do and gave the most amazing volume, curl, length and finish. It also has the most beautiful metallic bronze and pink packaging, I couldn't fault it. The best drugstore mascara i've tried. I would love to here how you got on with this products in the comments! As much as I love fluffy oversized jumpers and warm cosy winter themed leggings, Summer is my all time favourite season when It comes to fashion so I decided to share with you some of my favourite summer outfits! Miss Selfridge Playsuit-http://www.missselfridge.com/en/msuk/product/petite-poplin-bardot-playsuit-6686005?bi=0&ps=20&Ntt=playsuitsBardot tops, playsuits and dresses have been everywhere this summer, perfect for giving your shoulders a tan ( or freeze if you're experiencing UK weather). This is one of my favourites that can look great both in the day with flip flops by the pool or at night dressed up with an evening bag and some heels. 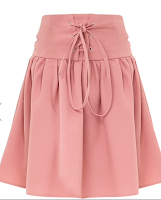 This pink corset tie up pink skirt is on sale for £10 on Pretty Little Thing and is the perfect summer skirt to pair with a bardot top and some stylish sandals. Lace shorts are some of my favourites along with floral in the Summer and these ones had the perfect design and a matching top to go with it. Sliders have been very popular this year and Topshop do some of my personal favourites in different designs at different prices. This glam purple feather bag can dress up an outfit giving a burst of colour that makes any outfit ten times more summery (also available in blue).